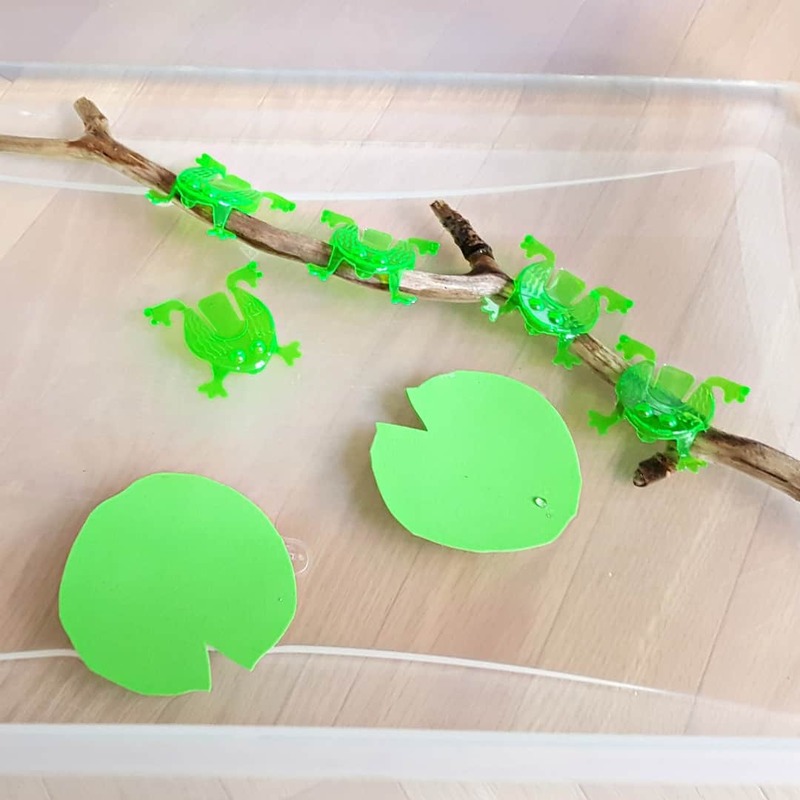 This frogs on a speckled log water play activity with frogs on a log is perfect for indoor counting and singing games. Your toddler will love playing with colorful toy frogs that jump and splash in the water. You’ll love the learning opportunities this fun activity offers! 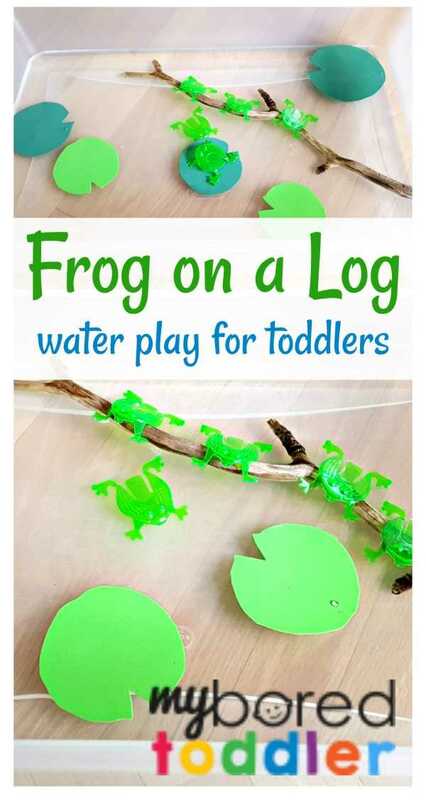 This water play activity with frogs on a log is perfect for indoor counting and singing games. Your toddler will love playing with colorful toy frogs that jump and splash in the water. You’ll love the learning opportunities this fun activity offers! Water play provides a fun opportunity for independent, child-led play. 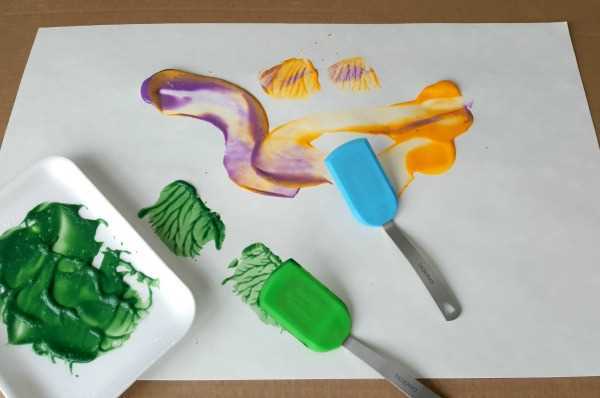 A simple water play area can be set up indoors with a plastic basin, a drop cloth, and some interesting materials such as small plastic toys, sponges, and funnels. 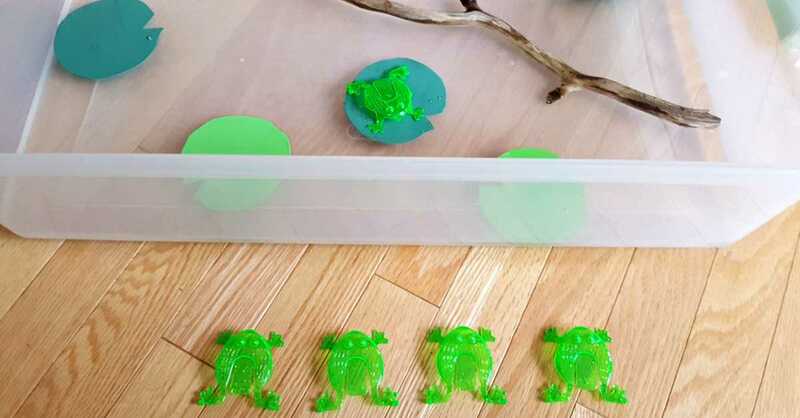 This frog activity is easy to set up with toy frogs and a small stick. We’ve even added some colorful green lily pads to extend the fun. Cut lily pads from green foam craft sheets. The size of the lily pads will depend on the size of the toy frogs you have. Our frogs are 2 inches (5 cm) long. Add water to a shallow basin. Set the basin on a drop cloth on the floor. Place the lily pads and stick (‘speckled log’) in the water. Count the frogs and lily pads. Is there a lily pad for each frog? Place the frogs in the water. Do they sink or float? Can you balance the frogs on the log? Line the frogs up on the floor outside the basin. Toss the frogs one at a time onto the lily pads. 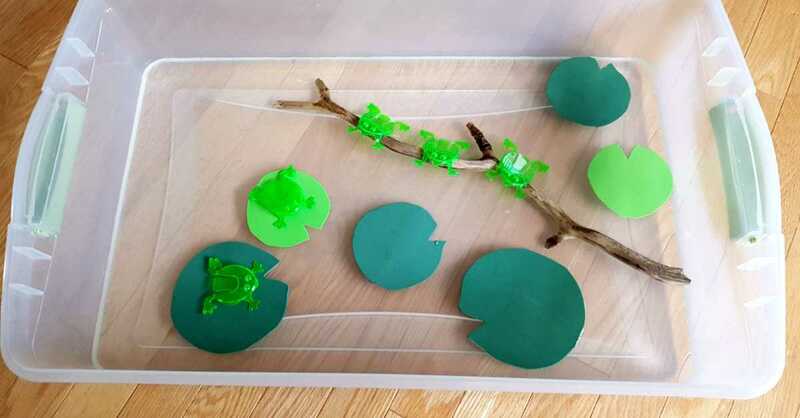 Help the frogs jump off the log (or the lily pads) and into the water one at a time as you sing the song.Indoor water play can be calm and soothing and a great sensory experience for kids. 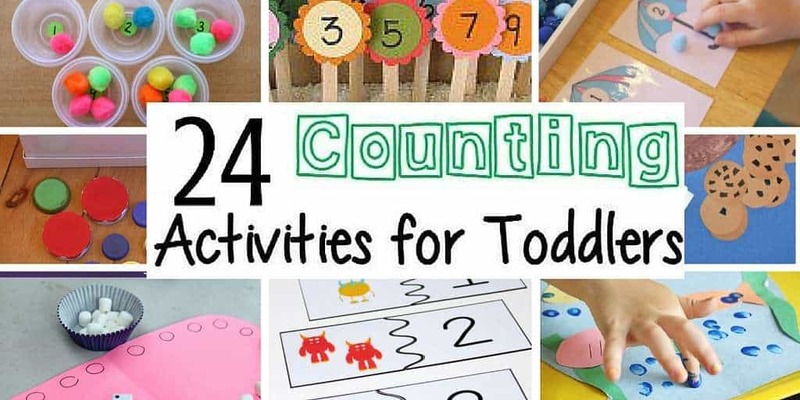 This activity is also a fun way to practice counting, engage fine motor skills, and do some great splashing!